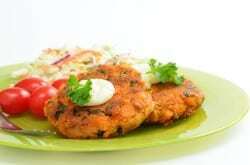 Quick and easy salmon patties are perfect for a quick dinner. Drain salmon, set aside 2 tablespoons of the juice. In a mixing bowl mix together the salmon, egg, and onion until sticky. Stir in flour. Add baking powder to the salmon juice, and stir this into the salmon mixture. Form into patties and fry in Crisco until golden brown. Could you please modify this recipe to state what size can of salmon? — Thank you.